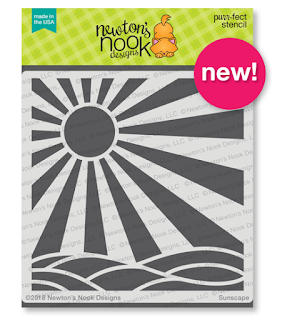 Hi everyone, welcome to day 2 of the June reveals at Newton's Nook Designs. 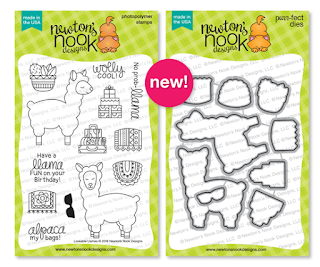 Today we're featuring this super amazing stamp/die set, Loveable Llamas. I just love coloring these llamas and the little accessories! I started with a tiny star background paper and inked over the top using the new Sunscape stencil. I added a little xoxo banner and popped up my llama and added his pretty blanket and a pot of cacti! Lastly I stamped the sentiment right over the sun. I just love how it turned out! I love blog hops because they inspire me to create-thank you. Beautiful colors and awesome coloring! Love this cheerful card!!! Colors are really gorgeous!!! I love this set and the way you colored the llama to look furry. I love your coloring. Your Llama basking in the sunshine is an awesome card! I love how you colored the llama! You sure makes some beautiful cards! that is so amazing card! Such a bright and happy card. Love the colors and the stencil and of course the star of ur card the llama. AWESOME card! I love everything about this card! The colors are just so vibrant! And that Llama is AMAZING! Love the colors and the stenciled background! Fun card! SO BRIGHT! I LOVE LOVE LOVE the colors! Great card! Love the stars in the rays. I love your background is stunning! So cool! I love the stars layered over the sunscape! And the coloring on the llama is fantastic! I love how you created the background, and the way you color the llama looks amazing. I love the intense colours you've used on your card to bring these images to life. Thanks for the inspiration. What a great card !! Your background is soooo beautiful ! !